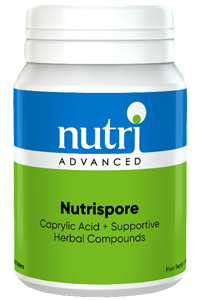 Nutri Advanced Nutrispore is a highly potent formula containing caprylic acid, herbal compounds and supporting nutrients to help support a healthy microbial balance in the gut. 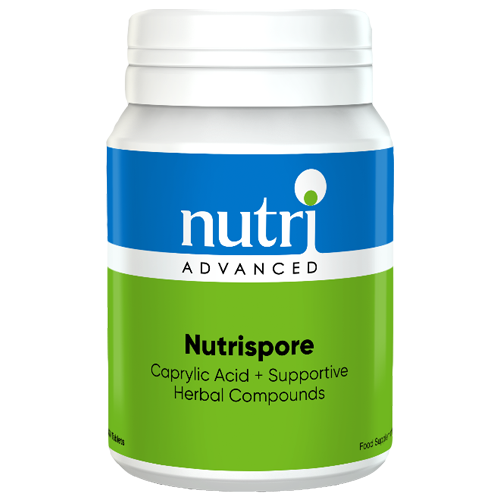 Nutrispore also contains zinc which contributes to the normal function of the immune system. Elements of Grapefruit seed may contribute to the microbial balance of organs and tissues. Nutrispore also features curcumin and oregano which help to facilitate digestion, and Aloe Vera which helps to support healthy gastrointestinal function. 1 tablet three times daily, or as directed. Tableted with:, Croscarmellose sodium, Gum acacia, Cellulose, Silicon dioxide, Stearic acid, Magnesium stearate. Coating (polyvinyl alcohol, talc, polyethelene glycol, polyabsorbate). Do not use if pregnant or breastfeeding. If taking medication or have a medical condition, consult a medical practitioner before using this product. May contain ingredients derived from nuts.